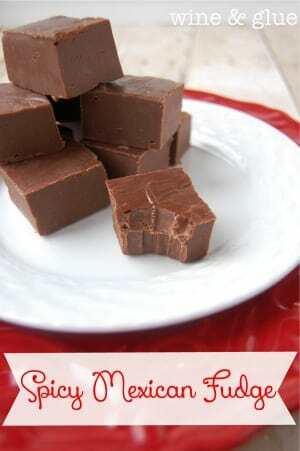 Chocolate Amaretto Fudge! 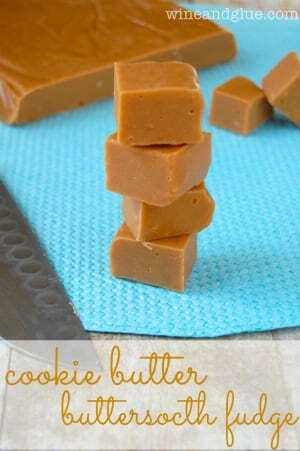 You are only four ingredients away from this amazing fudge! So yesterday was Quinn’s surgery. I think that I underestimated how stressed I was about it until the night before . . . and then the drive there when I felt so full of stress that I was going to burst. But when we got there, Quinn was the picture of calm. She let them do all the things they needed to do . . . . measuring her oxygen, taking her blood pressure, changing her into a gown. And then pretty much as quick as it began, it was over. And she was fine. . . . . Sort of. Don’t get me wrong! The surgery went totally fine. But general anesthesia is a lot for a little body! It took her awhile to wake up, and when she did, she wasn’t super happy about it. But still, she was pretty much the picture of calm and so brave, even when they took out her IV. She ended up being in more pain than we thought she would be. It was difficult for her to move, and agonizing to see her wince with pain. When we got home with her, she went straight to bed and just conked out . . . which we also didn’t expect. Both things did nothing good for my anxiety about it all. Can I be honest? I worry that as you are reading this you are judging me for talking about my own anxiety about it all, rather than my empathy for poor Quinn. But please let me assure you that I can do both. I can be totally anxiety ridden and thinking about losing my son during surgery, and also full of compassion for Quinn, who is undergoing something SO big when she is so little. I can do both. Things felt a little better when she got up from her nap and she was happy and more rested, and in less pain . . . but even as I write this, I’m still worried about her. I want to fast forward two weeks when all the bandages are off, all the pain medicine is gone, and she’s back to jumping on her brother’s back and trying to ride him like a horse. But! At the end of the day when we were saying what we were thankful for, Quinn said, “I’m thankful for Mom, because she takes such good care of me.” And then my hearted melted and my insides turned to jelly and all my anxiety melted away . . . for a little. Let’s talk about this fudge, okay? Because it’s chocolate with booze in it, which I’m pretty sure is the answer to this kind of day. Based on what you guys have been sharing and liking on my Facebook Page, you guys want CANDY! 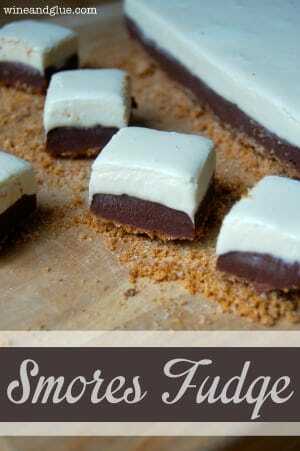 Especially candy that is good for the holidays, easy to make, and would make a nice addition to a tray of goodies. 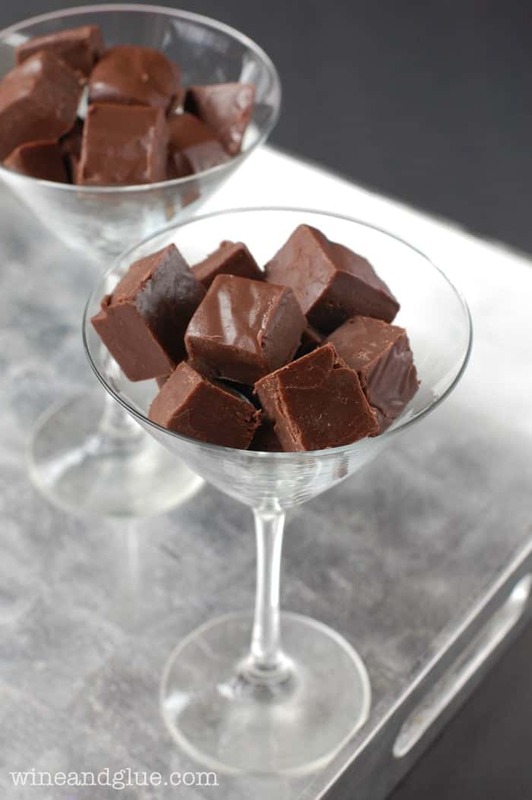 This Chocolate Amaretto Fudge, is totally that. And hello? It’s FOUR ingredients! It doesn’t get a lot better than that. Oh wait. It does. You know, when you add BOOZE! Hang onto your hats people, theres a lot more candy where this came from. Melt the chocolate chips over medium heat. While they are melting, stir in the sweetened condensed milk, stirring constantly. When it is fully melted, add the vanilla and the amaretto and fully combine. Pour the mixture into the pan and place in the refrigerator for at least four hours, though overnight is best. Remove the foil lined fudge from the pan, remove the foil, and cut. Store in the refrigerator. It’s so hard when your kids get surgery. We’ve even through that. Just keep those pain meds going on schedule. It’ll be over soon! I’m so glad things went well and she’s doing better. I can’t imagine what that’s like. Whenever my kids cry from being in pain or just getting their shots I get sick to my stomach. You are amazing no matter what people think 🙂 Yay for booze! I love amaretto so this recipe is just perfect for me. 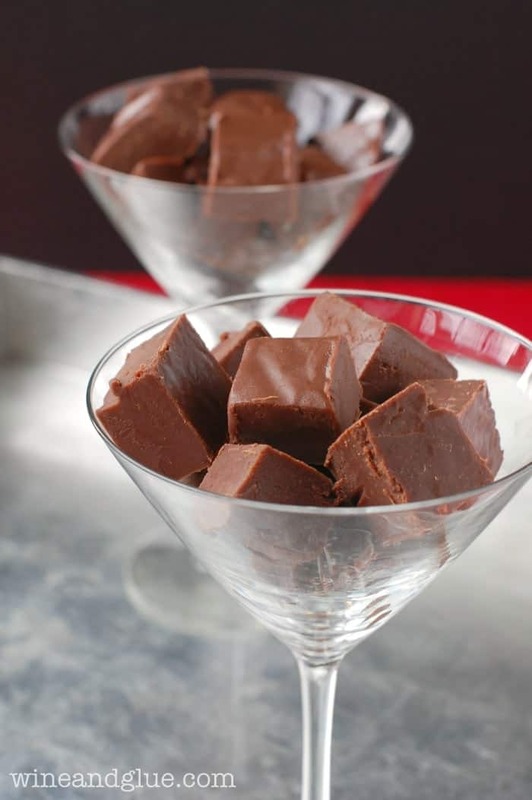 Craving some of this fudge right now – it looks wickedly delicious Lisa! I would have been drinking from the bottle AND eating fudge all day. ((HUGS)) to you!! How well do you think it would work if I subbed in bourbon or scotch? 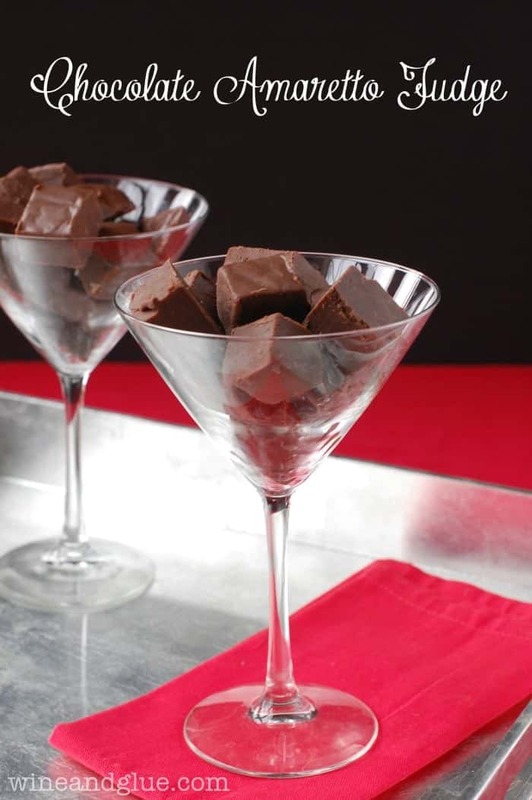 We aren’t really amaretto fans here, but the idea of scotch laced chocolate sounds yummy. Hmmmm . . . . I’m not sure. Here’s the thing, I think the alcohol content might affect things a little. So I’m sure that scotch has a much higher alcohol content than amaretto, so I wondering if that would effect the way that the fudge sets. You know? If you give it a try, let me know! What size(oz’s)can of evaporated milk? Oooo, definitely not evaporated milk! That will not work at all. You need Sweetened Condensed Milk and you need 14 oz. I’m so glad you liked it Julie! Made this fudge and it’s wonderful. First fudge I like. How long will it last in the fridge? Can this be frozen? recipe says store in fridge Also, while setting up in fridge, do you cover it or leave it open to the elements? You are absolutely right Mags. I lose track of what fudge recipes I’m talking about sometimes. Over all fudge stores better out of the fridge. However, the ones with alcohol stay set better in the fridge in a sealed container. Realistically, you could do either and it will still taste amazing. what happened to the Bailey’s fudge recipe? I no longer see it on this site. will you re-post it? Thank you. I do have to say… tried it with semi-sweet chips (that’s what we still had left over from winter baking) and may need to increase the Amaretto a bit next time because the semi-sweet slightly overpowers it. Still good… but more of a dark chocolate effect. Recipe is SO EASY! Thank you! I’m using semi-sweet chips how much more amaretto should I use? Is there a reciped for Kahlus fudge? No, but I think you could just sub the Kahlua for the Amaretto. Think I will try substituting frangelico – I’ll let you know how it turns out. ????. Thanks for the recipe! Hi , Quick question. Why does the Amaretto Fudge require only 2TBSP of Amaretto while the other fudge requires 1/4 of a cup of the booze ( Bailey’s and Fireball whiskey). I love Amaretto, can I increase to 1/4 cup with out destroying the mixture? It was the first recipe I did with alcohol, and I was nervous to use too much. So I think you can definitely try with 1/4 cup! Im sorry but confused the writter kept saying she. Then reffered to her son quinn who was having surgery. I lost my second child, a son named Elliot, during a surgery when he was one week old. So I was referring to the anxiety I felt because of that trauma while dealing with my daughter (Quinn’s) surgery. I have a dumb question to ask. Can kids eat this? Does the alcohol freeze out? I wouldn’t personally give this to my children because the alcohol does not cook out. I’m so sorry about your son. I just lost my daughter in September. She was 36 years old and also slipped away during surgery. Needless to say I don’t feel like celebrating. But we all have obligations. For some reason I thought amaretto fudge sounded so good!saw your recipe then read your beautiful post. I think it’s a sign that I picked the right recipe. Thank you and God Bless you and your beautiful family. Oh Mary, I am so incredibly sorry for your loss. I would not wish the loss of a child on anyone. The loss of a one week old and the loss of a 36 year old are no where near the same thing, but I can tell you that my loss has become less painful with time, and I hope yours will as well. Give yourself a lot of grace this holiday season and do only what sounds okay. I’m hoping the fudge brings a small smile. if you were to use amaretto oil do you know how much to use ? I have no experience with amaretto oil, but it looks like it is similar to using vanilla extract in a recipe, which would require different ratios of everything, not just the amaretto. 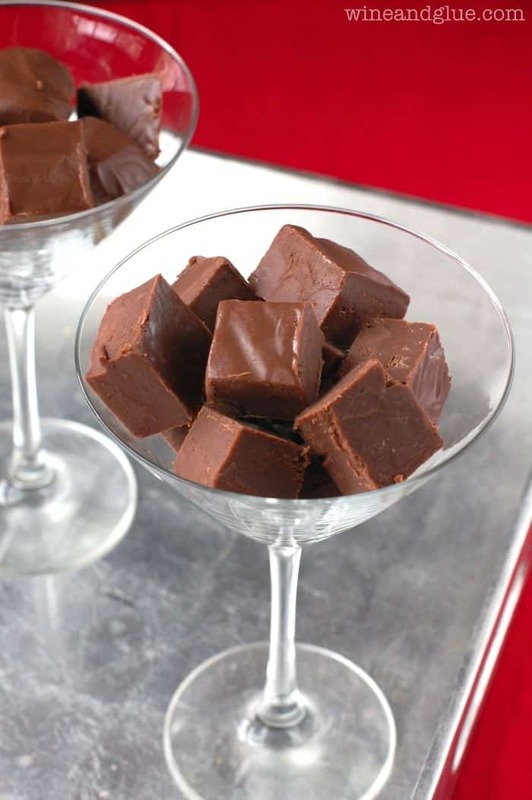 I would look for a basic fudge recipe (or use the one on the side of the can of sweetened condensed milk) and then just add few drops of the oil and taste it, seeing if you need more before the fudge sets.